Still swooning over Anushka Sharma or Amrita Puri’s Sabyasachi lehengas? But at the same time catching a fever due to the out of reach prices? Don’t worry, we’ve got 7 affordable designers that make equally beautiful and breathtaking lehengas! Mahima Mahajan is known to play with floral designs in such a way that they look not only pretty, but also elegant. You can find beautiful lehengas for INR 45k. Mahima Mahajan has a splendid collection, which you can check here. VVani assures to give you your dream lehenga that too within your budget! Her detailed and intricate designs will definitely make you fall in love with her! 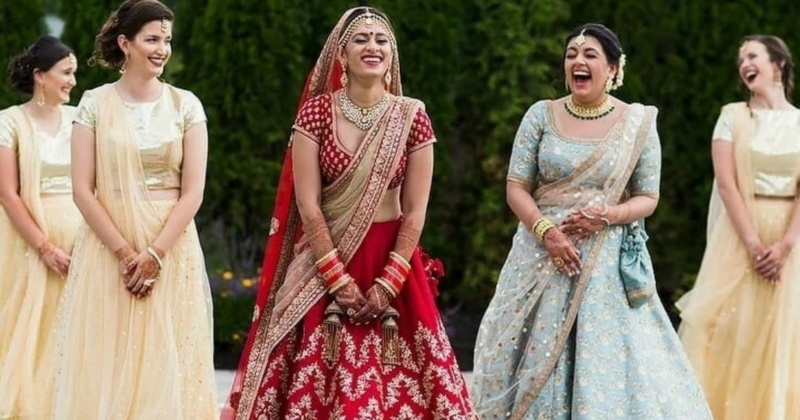 A good lehenga will cost you between INR 40k-45k. Image Source: VVani by Vani Vats. You can view more of their designs here. Rianta’s is the new kid on the block who has a lot of fresh and contemporary designs to offer. They were also nominated for the Best Debutant Designers 2017. All their lehengas are under INR 50k! Image Source - Ombre/ Harsheen Jammu. You can check out more of their work here or on their facebook page. Another member to join the ‘under 50k’ club is Malasa. Nimrit and Jyoti Gill believe in making an electric mix by playing with soft and dreamy festive wear to jewel tone ensembles that define wardrobe essentials. You can check out more of Malasa on their Instagram page or Facebook page. If you are looking for a steal deal, stop right here! Head to Anisha Shetty and you’ll find breathtaking lehengas under INR 35k! Their designs are beautiful and so are the colours. They ship worldwide. Check Anisha Shetty’s work here. Summer colours, lightweight lehengas, intricate designs and affordable prices rightly describe The Peach Project. The price ranges between INR 24k-40k. The Coral Shoreline Lehenga set by The Peach Project. You can check out their various designs here. If you want something relatively simple, but still want to garner attention and compliments, Ayika is your go to stop. They start at as low as INR 15k and go upto INR 50k. Ayika’s designs can be viewed here. But if you still wish to wear a big designer lehenga, you can rent it from Flyrobe. They flaunt an array of designers such as Anita Dongre, Gaurav Gupta, Divya Reddy, Bubber Couture and many more. What are you waiting for? Go grab your bridal dream!